Though they inhabit a wide variety of habitats and exhibit incredible diversity, every snake species shares the same set of basic needs. Like all animals, snakes require appropriate food and water, but they also need shelter and access to appropriate temperatures. Additionally, snakes must defend themselves from predators, and have evolved a variety of mechanisms to do so. All 3,432 currently described snake species consume animal prey for food. As a group, snakes prey on an incredible diversity of creatures, including mammals, reptiles, amphibians, insects, spiders, centipedes and scorpions. Some species specialize on one prey item, such as southern hognose snakes (Heterodon similis), which prey almost exclusively on toads, or queen snakes (Regina septemvittata) that only consume freshly molted crayfish. Other species will eat virtually anything they can catch and overpower, such as black racers (Coluber constrictor) and coachwhips (Masticophis sp. ), which consume prey as diverse as insects, rattlesnakes and birds. Like all animals, snakes require liquid water to survive. Most terrestrial species acquire water from lakes, rivers or temporary puddles. Species that live in areas with little standing water collect dew or rainwater on their backs, and then drink it one droplet at a time. While snakes that live in freshwater drink freely, sea snakes must find freshwater to drink. Sea snakes can drink from puddles of rainwater on shores and islands; alternatively, rainwater forms a “lense” on the surface of calm areas of the sea, and the snakes can drink this water before it mixes with the salt water below it. While a few species -- notably pelagic sea snakes (Pelamis platurus) -- live most of their lives away from any sort of structure, most snakes require some sort of shelter. 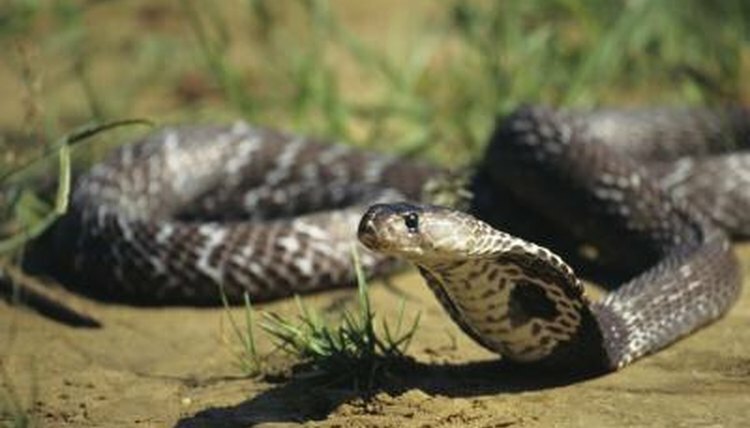 Snakes in some areas must avoid temperature extremes, while all species must hide from predators and deposit eggs or give birth. Snakes use a variety of shelter types, including burrows, tunnels, leaf litter, caves, tree hollows, rocks, clumps of vegetation, logs and human debris. As ectotermic animals, snakes require access to appropriate temperatures. For some species, especially those living in the tropics, the ambient temperatures are adequate to keep their body within the proper range. Other species must be able to bask in the sun or sit atop a sun-warmed rock to raise their body temperatures. Conversely, snakes must be able to retreat from excessively high temperatures, by venturing underground or becoming nocturnal until the heat subsides. Many different predators hunt snakes wherever they live; each species develops its own way to defend itself. Many snakes are extraordinarily cryptic or secretive, and try to avoid their predators entirely. Many species rely on speed and agility to escape from predators, while others resist the urge to flee, instead preferring to stand and fight. Even nonvenomous snakes can inflict painful wounds to a would-be predator, and most snakes that bite defensively also exhibit powerful anti-predator displays such as tail vibration or hissing. Do Snakes Emit Odors When Hibernating?